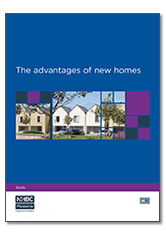 Through illustrations and photographs, this guide illustrates the main benefits of new homes, It is structured on an NHBC Foundation survey of people who had recently moved into a new home which bought attention to the aspects of new homes that were most appreciated. It includes 12 themes, in each case setting out what is offered by a new home and making contrasts with the uncertain condition of older homes. Ready to move in – new homes are ready to enjoy without any concern about what has been glossed over by previous owners. Everything is new – appliances and systems all new and will work well for years to come. Modern layout – efficient use of space and the right balance of living and storage space. Modern facilities – well laid-out bathrooms and downstairs WC, and often an en suite. Energy efficiency – cost – energy bills should be about half those of Victorian homes. Energy efficiency – comfort – cosy homes that heat up quickly, are well ventilated and are not prone to condensation and mould. Safety – smoke alarms and wiring – Mains-powered smoke alarms and protection from electric shocks. Safety – glazing and stairs – safe steps and balustrades, and inclusion of safety glass where needed. Solid foundations – robust and resilient foundations. A quiet home – mandatory measures to ensure good sound insulation between homes. Security – robust doors and windows with additional locks and security devices to keep intruders out. A new community – opportunity to meet new neighbours with similar interests and aspirations. Text: you are free to adopt text from NF73. Drawings: you are free to adopt the drawings from NF73, however for each use in your document you should provide the following acknowledgement: Victoria Kirk, Studio Partington. Drawings have been made available for download at the links provided below. Photographs: you will need to seek separate agreement to use the photographs in this guide. For those credited to Thinkstock will need to purchase separately with a suitable licencing arrangement for your own use.